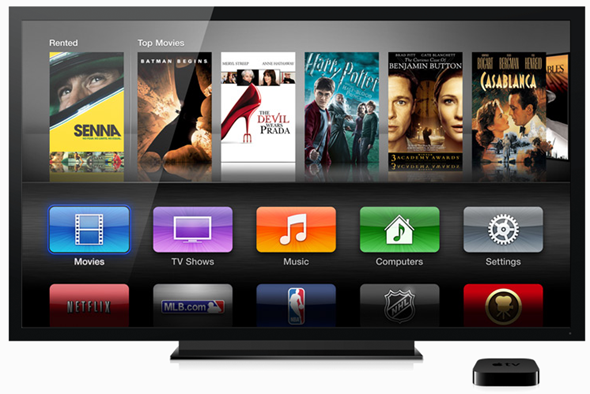 The controversial new Apple TV software was in testing at Apple five years ago, according to an ex-employee, and then-CEO Steve Jobs was the man that knocked it back. Years later, Apple has released it upon an unsuspecting public. Apple’s big iPad event may have been predominantly to announce a new tablet, but the tech giants also announced the third-generation Apple TV at the same time. Sporting new innards that allow the Apple TV to stream 1080p and a redesigned user interface, the new hardware went on sale at the same $99 price that had made the previous generation Apple TV so popular. Even with the 1080p streaming that many had been crying out for though, Apple fans were not as happy as one would imagine. The reason for that is the new user interface that Apple has decided that we will all use until something better comes along. Hopefully, that won’t be too long given our experiences with the new interface so far. Interestingly it would appear that we aren’t the only ones that think the new interface leaves a lot to be desired. According to one ex-Apple employee, former CEO and co-founder Steve Jobs also wasn’t a fan. In fact, the man himself apparently vetoed the user interface years ago. 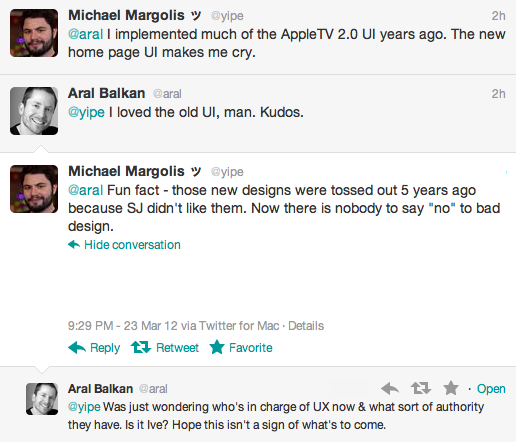 During a series of tweets yesterday, ex-employee Michael Margolis shared that the current Apple TV interface was on the drawing board some years ago and that, according to Margolis, Steve Jobs was the reason that we never saw the colorful interface make its way to a shipping Apple TV product. Now, five years after Apple first dumped the interface we are all using now, someone in Cupertino clearly seems to have decided that now is the time to resurrect the iOS-like solution that currently being much derided across the internet. As Macgasm’s Joshua Schnell points out, the really interesting part of this news is that Apple has gone back on a decision that was made around five years ago, and with Steve Jobs unfortunately no-longer around there was nobody to stop the madness. The real question that we are left with now is a simple one: just who is making user interface decisions at Apple these days, and did they actually see or use the new Apple TV software before giving it the go-ahead? We can only assume not!